For centuries, nature has generously shared its natural resources with man with the onset of the contemporary technical revolution, new and unknown technological inventions are demanding an increase in the use of natural resources, thereby creating impassible conditions in which to live. One of the precautions necessary for preserving nature is to create more reserves in which man’s input is minimal and the intrinsic beauty can remain intact. In addition, it is necessary to declare such “ natural places “ protected because of the importance such places serve to science and the society. Situated within the municipality of Kubrat is such a reserve, called Mustereka. 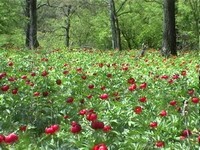 This reserve is a natural field of wild peonies (the Paeonia Peregrina Mill). This reserve is 50 dekares in area and is the only one of its kind in the region. The village and Belovets, 40 km southeast or Russe and 45 km northwest of Razgard, is nearby wild peony reserve. For many years at the beginning of every May, hundreds of people – singers, dancers, and spectators, have gathered amongst the red sea of thousands of blooming peonies. This time is used to celebrate national traditions with native costume, songs and dances. The “Bojurite” international folk festival acts as the spiritual bridge and keeper of the folklore tradition of the Balkan states. With their love of folk art and the national traditions of their people, the Balkan states demonstrate a hope for a better future and peace and security of the nations of these countries.